There are many hair extensions available in the market some are artificial hairs, some are human hair but not pure and are processed using chemical and other materials. The most used and on demand hair extensions are the virgin hair extensions. Virgin hairs are pure human hairs and are not processed and are in its original form. These are collected from a single donor or combination of multiple donors. Donor can be American, Asian, Brazilian or from any other country. Virgin hairs are collected and preserved carefully in hair extension packaging so that these don’t loose their natural effect and feel. Virgin Hair extensions these days are used quite widely and is a fashion trend these days. Every women needs separate extension for each function. Packaging for hair extensions is very important. The Hair extension packaging should be designed in a way that the internal product is visible as well as touchable so that buyers can see and feel the product before they buy it. 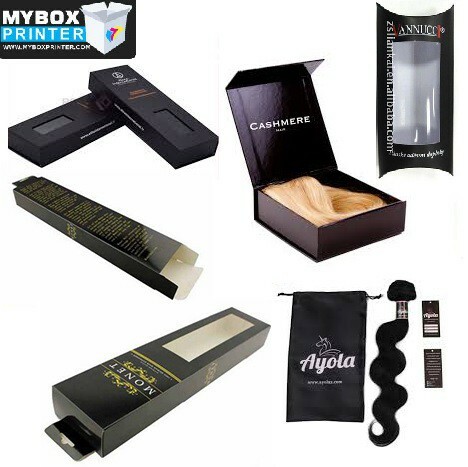 Below are few of the processes those are necessary for an ultimate box packaging for virgin extensions. Virgin hairs are Remy hairs and are not altered by dye, perms or any other processing. The packaging of these extensions should be done in a way that these boxes appreciate the product inside. Below are the factors those help to create ultimate boxes for hair extensions. As the hairs are in natural form so the natural recyclable cardboard should be used for packaging. If the extensions are longer then its best that only one fold should be put on the extensions so the box should be long enough to hold the extensions with one fold only. There should be a long window on the front of the box with or without cello window so that hair extensions from the outside are visible. Hang tab should be made on top end of the box so that packaging can be hanged at the shelf on retails stores. These hang tabs are very important and can be of different shape and style. There should be a proper insert to put inside the box. This insert will hold the extensions in its place. The color selection of the packaging should be according to your company logo and colors. Usually it is considered that hair packaging should have black color in it. So while choosing the colors, make sure, your color selection does include the black color as well. Company logo should be at the front top above the window along with company tagline. There should be contact info at the back of the box and bar-codes or other small icon logos. There are many hair extensions packaging styles available. The standard style is tuck flap style with hang tab on the top. Pillow style boxes can also be used for hair packaging. Pre-assembled rigid two piece setup boxes are also used as hair extension packaging but as these are expensive boxes so these are only used for the hair extensions which are pure virgin and are expensive.